Microscopic image of synthetic human prions accumulating in the brain of a mouse that was genetically altered to produce a certain human protein. 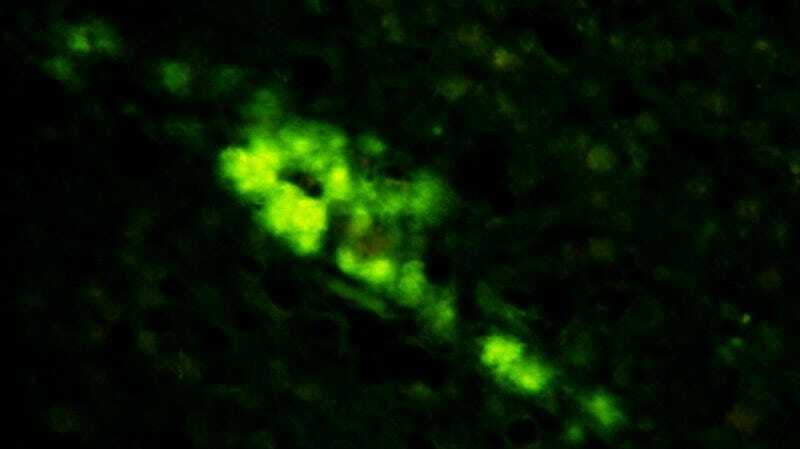 Researchers from Case Western Reserve University have synthesized an artificial human prion, a scientific first that could eventually lead to treatments for Creutzfeldt-Jakob disease and other deadly brain-wasting disorders. In tests, the resulting synthetic human prions were shown to be infectious to transgenic mice, which were “humanized,” or genetically altered to express a particular human protein. In two separate experiments, the recombinant human prion caused serious neurological dysfunction in infected mice after an average of 459 and 224 days. “The neuropathology, replication potency, and biophysical profiling suggest that a novel, particularly neurotoxic human prion strain was created,” declare the authors in the study. But to be fair, the effect of that this artificial prion might have on humans is unknown. We’re still a long way off from having a treatment or cure for transmissible spongiform encephalopathies, but scientists now have the means to create synthetic human prions in the lab. This will undoubtedly aid future studies as synthetic nonhuman prions, while reasonably informative, were not able to convey the full human story. What Is Nipah, the Virus Spread by Bats That&apos;s Killing People in India?